This research discuss, Chinese tourist preferences on cultural tourism product in Bali, and its characteristics. The aim of this research is to identify the characteristics and to determine how Chinese tourist preference on the cultural tourism product in Bali. The method of data collection utilized observation, questionnaire, literature study, and documentation. The result shows that the characteristic of the Chinese tourist in Bali from point of view tourists descriptor are dominated by Chinese tourist whose age are 25-44 years and their job as private employees who have married. Based on trip-descriptor are dominated by the purpose of their traveling to Bali are the holiday. Most of them got information from the internet, and arranged by tour package with the length of stay is 4-7 days in Bali. Preferences of Chinese tourist toward cultural tourism in Bali are in term of historical buildings prefered to Tanah Lot Temple, in term of historical places prefered to Bedugul, in term of traditional dances prefered to Barong Dance, in term of local food prefered to Suckling pig, in term of handicrafts prefered to traditional statues, in term of indigenous village tours prefered to the traditional village of Panglipuran, in term of Subak prefered to the Subak in Tegalalang, in term of cultural festival prefered to the Bali Arts Festival, in term annual ceremony prefered to have tour during on Nyepi day, in term pre-wedding tour prefered to wear traditional Balinese costume, and in term spa product prefered traditional Balinese massage. Mahendra Putra, I. W. A., 2016. Pengemasan Paket Wisata City Tour Berbasis Budaya Di Kota Denpasar Bali. 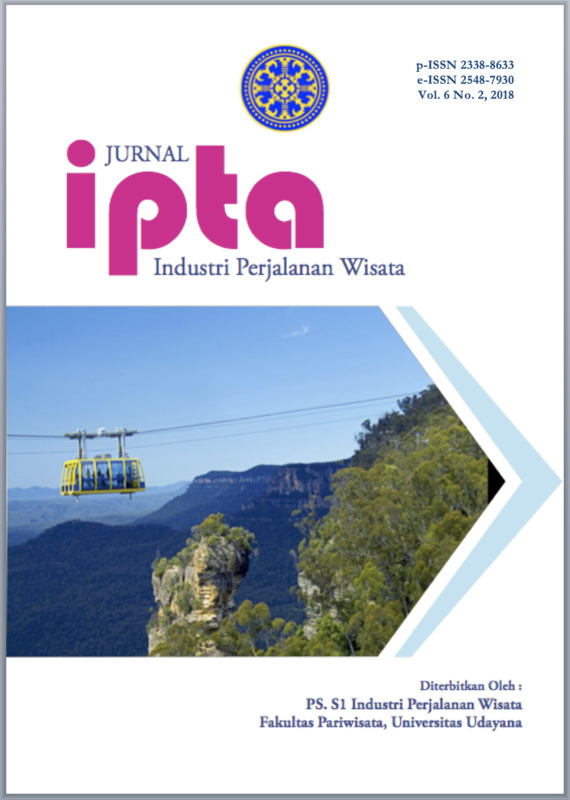 Jurnal IPTA, Vol 4 No 1. Mudana, I. W., 2012. Modal Sosial Dalam Pengintegrasian Etnis Tionghoa Pada Masyarakat Desa Pakraman Di Bali. Vol 1, No. 1. Nafila, O. (2013). Peran Komuninas Kreatif dalam Pengembangan Pariwisata Budaya di Situs Megalithikum Gunung Padang. Jurnal Perencanaan Wilayah dan Kota, Vol. 24, No. 1. Suryawardani, IGA Oka, Wiranatha, Agung S.2013. Chinese Tourists: Emerging Market for Bali. Udayana University. Suwena, I. K. & Widyatmmaja, I. G. N., 2010. Pengetahuan Dasar Ilmu Pariwisata. Denpasar: Udayana University Press. SUGIANTO, Sigit; SENDRA, I Made; KUSUMA NEGARA, I Made. PREFERENSI WISATAWAN CINA TERHADAP CULTURAL TOURISM DI BALI. Jurnal IPTA, [S.l. ], v. 6, n. 2, p. 115-123, dec. 2018. ISSN 2548-7930. Available at: <https://ojs.unud.ac.id/index.php/pariwisata/article/view/45495>. Date accessed: 21 apr. 2019. doi: https://doi.org/10.24843/IPTA.2018.v06.i02.p05.